Office 365 empowers teamwork and content collaboration through a variety of services. In this series, I’ll be focusing on the three Office 365 services that make up the backbone of content collaboration in the modern workplace. In this third and final installment of the series, we’ll be discussing how SharePoint team and communication sites can be used to share and collaborate on projects and files. In the first part of this series, you created a PowerPoint presentation in your OneDrive, which is your personal space to work with content. The presentation was intended to eventually be shared with all your marketing colleagues, but first you shared it with a specific coworker, Aldo, to get feedback directly in OneDrive. Once you and Aldo were finished reviewing the presentation, you moved it to a private space in Microsoft Teams to start collaborating with all your product launch team members. Now, it’s time for the last part of your content collaboration process: sharing the presentation publicly with the entire organization. The navigation elements are disabled. You can click on the red Add News button, but there isn’t an option to save or publish the news page. The main purpose of this feature is highlighting important SharePoint pages related to the collaboration activities, such as manuals and procedures. You can work with SharePoint News and receive notifications with the conversation tab. This part is bit of a struggle for business users, as it introduces a new communication channel on top of the existing one in Teams. I would advise to only use SharePoint News for formal news items that you want to share with all of your colleagues on the SharePoint home page (your team needs to be set to public in order to do this). The chat works well; it lets you divide tasks and ask for updates. The major downside compared to Teams is that there’s no way to save your chat history in Office Online. SharePoint team sites focus on collaboration; SharePoint communication sites focus on communication. This is a crucial concept to understand. 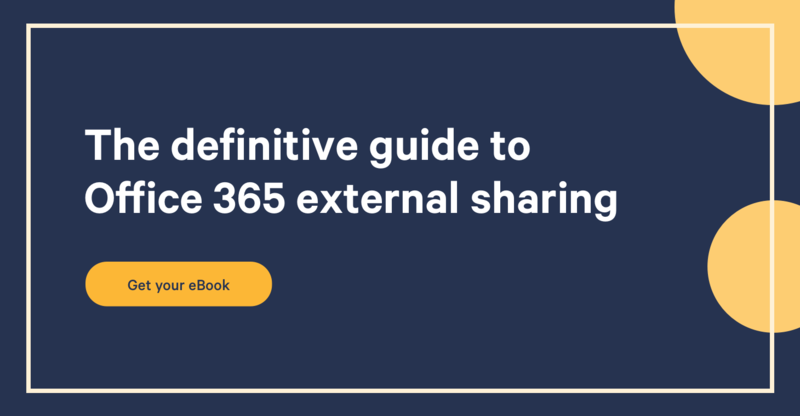 Because communication sites aren’t connected to any Office 365 group, there’s no built-in way to copy or move files from Teams to a communication site. To share your presentation via the communication site, you need to locate the file within the team site, then copy or move it from there. Once you’ve moved the presentation to the communication site, you can give it visibility by creating a News page or using the File view web part. Unfortunately, this results in not being able to chat with the guest within Teams. In my opinion, the experience of collaborating with external users in Teams and SharePoint is lacking due to this issue. To enable collaboration with guests, you have to check the right settings in the SharePoint Online admin center. Don't allow sharing outside your organization: Completely disables collaboration with guests. Allow sharing only with the external users that already exist in your organization's directory: Only guests who have been added to your Azure Active Directory (AAD) can be invited to collaborate. An administrator has to manually add each guest to the AAD, unless the guest in question was invited before this option was turned on. Allow users to invite and share with authenticated external users: Lets users invite guests within a SharePoint site. The guest must have either a Microsoft account, a work- or school-related account from another Office 365 subscription, or an Azure Active Directory subscription. Allow sharing to authenticated external users and using anonymous access links: Anonymous sharing links can be generated for documents and folders. The best choice will depend on your information security policies. Do you require full control over any and all access to your data? Go with the second option to ensure that all external collaborators have previously been added to the Azure Active Directory by a member of IT. Otherwise, use one of the last two options to let your site owners approve or add guests to their team sites without having to go through IT. Keep in mind that you’ll need to turn on the modern SharePoint Online admin center in order to manage modern team sites. The simple answer? SharePoint is used to store the content related to conversations that are hosted in Microsoft Teams. Of course, there’s a lot more to SharePoint, but I find this answer does a good job of breaking down the key concept in way that’s easy to understand. As you can see, each channel automatically gets its own folder within the Shared Documents library. Fun fact: you can delete the folder that’s connected to a channel directly from the SharePoint team site without deleting the channel itself. That said, the folder will just keep being restored. This doesn’t work both ways, however: creating a new folder within a SharePoint team site won’t create a channel in Teams. The longer answer: Teams is your collaboration and conversation hub. It lets you easily collaborate on content with your colleagues and provides an all-in-one interface that integrates the different Office 365 services you’re using. SharePoint, on the other hand, is designed to store content and should be used as such. People who have been using SharePoint for years to collaborate on content can keep doing so if they so choose, but they’ll be missing a lot. Because of this, I see a huge potential in adding a “Teams conversations” web part to SharePoint: it would ensure that people who prefer to use SharePoint aren’t missing out on important conversations. Best of both worlds. Our Office 365 collaboration journey started in OneDrive for Business, your personal space, where you created a presentation and asked one of your colleagues to jump in and provide some feedback. Afterwards, you moved the file to a shared collaboration space supported by Microsoft Teams and a SharePoint team site. Finally, once your team was done working on the presentation and everyone was satisfied with the result, you transferred the file to a SharePoint communication site so that all employees can access it via the company portal. A final thought to wrap up the series: you’ve always had control over the location of your content within your favorite collaboration services, but it’s never been easier to work with others in Office 365. As Microsoft keeps getting better and better at understanding digital teamwork and collaboration, its tools will continue to improve. So far, so good! Follow @jasoosterveld and @sharegatetools on Twitter.